about the ridiculousness of your D.
I've been having a few unexpected low-level 'dips' recently. Not really hypos exactly, just a few readings under 4 where I wouldn't expect them. And the more of those I have, the more highs I seem to have too. Not ideal. Figured it was probably basal/warmer weather related, so thought I would do some basal tests. First day I tried to do 'lunch - eve meal'. But I had a 3.7 mid morning after a gym visit so scrapped that idea. Second day I thought I'd do 'breakfast - lunch'. Woke up to a 3.4. Hopeless. On Monday evening this week I took the bull by the horns and took my entire basal pattern down by '1 notch' just so I could get some basal tests in. I've spent Tuesday and Wednesday battling relentless highs. I did manage to get a semi-basal test in yesterday afternoon, which was inconclusive. I've gone from 'a bit too low' to 'pretty much continually too high'. Woke to 10.8 this morning having gone to bed with what Artoo assured me was exactly the right amount of IOB to deal with my 10.6 at bedtime. So now I'm back to where I started - basal back down again. The really annoying thing is that I have two basic basal 'patterns' running. One for weekdays, the other for weekends. Initially this was just to account for waking up a bit later on Saturdays/Sundays, but 'weekend weirdness' soon meant that the weekend pattern was tweaked down and is now regularly only 80-90% of the weekday one. Even when activity levels seem identical I just seem to need less basal on weekends. It's incredibly frustrating to have to fight relentless highs with a basal of 11.8u a day on Tuesday, when 10.6u on (Bank Holiday) Monday didn't result in those stubborn highs at all. Less insulin = lower levels. More insulin = higher levels. Madness. I think this is what grinds me down most about living with diabetes. Where on one week you put the effort in, count carbs, make corrections and levels behave themselves really nicely. But then another week you put in exactly the same amount of effort and use exactly the same approaches for the same meals that you know work well (because you experimented for ages to get to that point) - except that this time it just doesn't work. And I pretty much know that my basal being 'out' causes this. And trying to fix it so that I can actually test basal has given me the high BG grumps. It's been a busy old time recently, and updates on the blog have taken rather a back seat. Sorry about that! 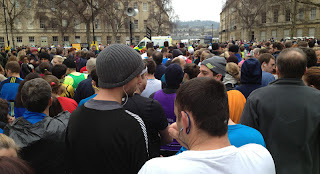 I realised this week (on Monday in fact) that I had not yet even managed to post an update following my Half Marathon shenanigans in Bath exactly two months ago today. Shocking! Part of the reason for this post is to say an ENORMOUS thank you to everyone who donated so very generously in support of my race charity Diabetes UK, in fact your generosity was so apparent that I was also able to donate to Medical Detection Dogs (the tiny charity that is able to specially train clever pooches to sniff out hypos and hypers). In total you raised the mighty sum of £685.50, you should feel very proud of yourselves, you rock! Ready for the off at the Bath Half 2013I had a great time on the day itself. It was bitterly cold at the start where everyone stood shivering for about an hour, but the mood was very cheery nevertheless. It was my first distance race of any kind, and I think I had naively underestimated the experience of running among something like 11,000 other people. It took much longer than I'd thought to find space enough to run at my 'own' pace. I was able to finish the 21km (13ish miles) in 1hr 46 mins, which is just about as fast as I ever thought I'd be able to do it. To say I was pleased with those is a bit of an understatement! I wondered at the time if perhaps I should run a half marathon every day? As is the way of things, it has taken me a fair old while to get the last few donations collected, but the cheques are now on their way to the respective charities. Immediately after the race I'd found myself reflecting on the unexpected enjoyment I'd found in the training, but thought I wouldn't hurry to take part in another event. Then a *very* odd thing happened. Last Sunday was the London Marathon, and I actually found myself thinking, "Well... I wonder if I could...". Encouraged by Dave and his tangerine enthusiasm I have unexpectedly put my name forward for the 2014 ballot. The chances of making it into the event are pretty slim - but it would be an interesting challenge! The rest of March and April have been a bit of a mixed-bag levels wise. March, and Easter in particular involved quite a few family get togethers and celebration meals which are always fraught with guesswork and wild stab-in-the-dark boluses with all the (lack of) success you might expect. April looked to be a little more settled in patches, but by the end of it a few chaotic days had worn me down, wrecked my averages and SD and I ended the month feeling quite grumpy about the whole unrelentingly inconsistent business. Part of me thinks I am pushing myself too hard and need to learn to be happier with the successes I am seeing rather than contantly reaching for those elusive 'perfect' days. Many people who have lived with Type 1 Diabetes for any length of time will be familiar with that feeling I think. I've decided it's time to run a few basal tests during the day just to make sure there is nothing obviously wonky on that score. A tiny dip below 4.0 after the gym has put paid to that for today. Ah well. Enjoy your Bank Holiday everyone!